Earlier this year, as the research reports predicted a rise of the virtualization market and the finding comes as no surprise as the licensing of newer products took a deep plunge more than a decade ago when the technology became mainstream. The fact that VMware has continued to withhold its position as a leader for the seventh consecutive year, pronounces its status quo where enterprises have a steady reliance on VMware’s virtualization and cloud products. With that, VMware has an assortment of trusted technology partners, with whom it works hand-in-glove to ensure its large global user-base capitalizes on its software platforms. These solution providers have become more than a ‘point person’ and are constantly renovating the VMware market. From consultation service that aligns an enterprise infrastructure with its goals and objectives to implementation assistance, these solution providers have become the runway grounds for VMware adopters. These providers also helping organizations with post-setup support and also offer performance enhancements to the platform to facilitate scalability and flexibility. In the last few months, we have analyzed hundreds of VMware solution providers and shortlisted the companies that are at the forefront of tackling challenges in the VMware ecosystem. A distinguished panel comprising of CEOs, CIOs and analysts including CIOReview's editorial board has selected the final list of VMware Solution Providers 2016. The selection is based on the vendor's capability to offer cutting edge technologies and solutions that add value to the burgeoning VMware arena. 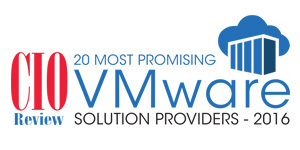 We present to you CIOReview's 20 Most Promising VMware Solution Providers 2016.